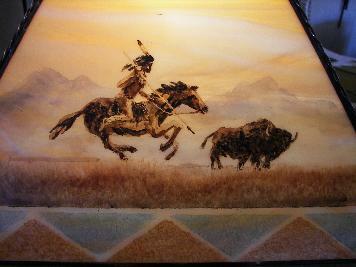 I am pleased to introduce my new Wild West Collection. 100% again made in the USA in my studio. Inspired by my travels through the American West. 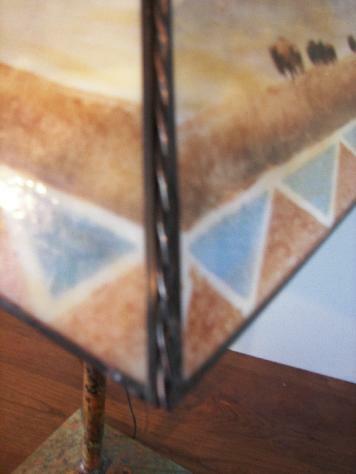 These lamps and lighting fixtures are made of natural copper. 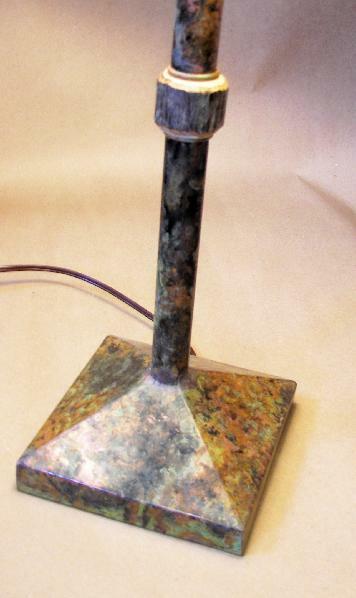 The patina is multi colred and variagated through out. 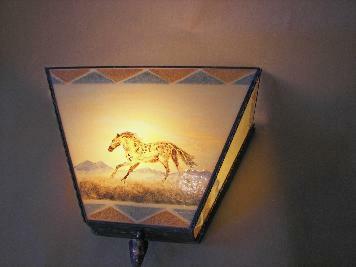 The shades are hand stenciled and hand painted kiln fired glass. 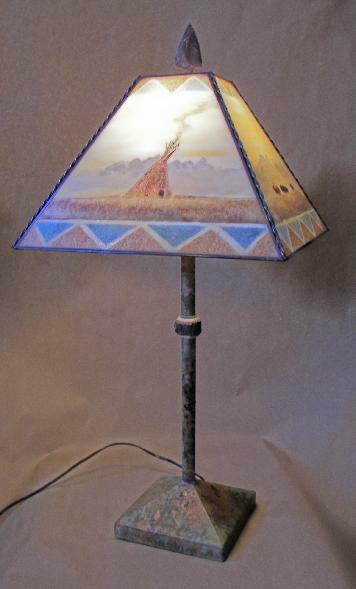 Like all of my lamps the paint turns into glass and fuses with the stained glass when fired in the kiln.The soothing quality must be seen first hand as the web-site pictures can not describe the true beauty of these artworks.The scenes depict the west before it was won. 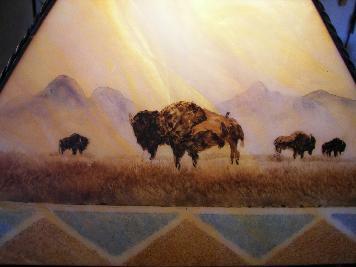 Native American motif's including teepees , buffalo , wild stallions and braves on horseback are depicted in the open landscape. 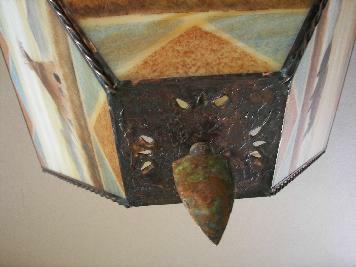 Notice the arrowhead designed finial , the roped edge beading and the hickory accent. The natural copper brings out the color of the old west. 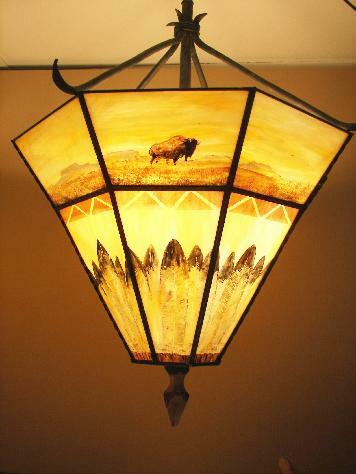 Currently the studio is producing a full line of this lighting. Accent table lamps, end table lamps, floor lamps, wall sconces, ceiling fixtures and hanging chandeliers and pendants. This pendant can be made any size. 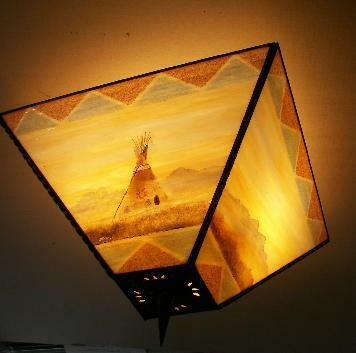 It is inspired by native American warbonnets. Custom work is my specialty. Copper, glass and natural hardwoods combine to compliment the painted glass. These designs are available in various sizes. or e-mail rjstump@aol.com To talk about your lighting needs.